On Monday night the metropolis was visited by two dreadful fires, which, in a very short period, laid in ruins a vast amount of valuable property, deprived one person of life, and severely injured three others. The first broke out upon the premises belonging to Mr. Hatfield, a Berlin wool-dealer, situate in Albany-street, Regent's-park, next door to the Windsor Castle tavern. The second disaster occurred upon the premises belonging to the Rev. Dr. Dale, in Amen-corner, Paternoster-row, City. The circumstances connected with the first fire were of a very distressing character. Shortly after the shop was closed the inhabitants were startled by a report like that of a cannon, and, at the same time, the greater portion of the premises, which were four stories high, were blown out into the street, the floorings and roof were lifted into the air, the brick wall was demolished and sent flying in sundry directions, breaking in the shop fronts of at least a dozen houses on the opposite side of the street, seriously injuring a great number in Ernest-street, forcing in the windows of the Windsor Castle tavern; and at the same moment, as if by magic, the whole of Mr. Hatfield's premises remaining burst forth into a general blaze. An immediate communication was forwarded to the barracks in the same street, and thence the intelligence was despatched to the Brigade and West of England engine stations. The first engine that arrived was that belonging to the Royal Horse Guards (Blue), which was accompanied by nearly 200 soldiers, The West Middlesex works afforded an instant supply of water, from which the engine was set to work, but the fire was too strong to be extinguished by that force. Other engines of the London establishment and West of England reached the spot in rapid succession, and they were set to work under the superintendence of Mr. Braidwood. Notwithstanding the exertions of the firemen, however, the flames continued to progress most fearfully, and it was not until nearly one o'clock in the morning—three hours after the outbreak—that they were entirely extinguished. The destruction of property occasioned by the explosion is most serious. Of the house itself, in which the accident originated, not a vestige remains. That portion of the building not immediately destroyed by the explosion was wholly consumed by the fire which occurred subsequently, and not one brick remains upon another. The two adjoining houses—the Windsor Castle ta­vern on the left, and a hosier and glover's shop on the right-hand—are shat­tered to their foundations, and the front wall of the latter was expected to fall during the whole of Tuesday. The surrounding property is injured to an extent which would not be credible to any except an eye-witness; and how so much devastation could have been accomplished without a greater sacri­fice of human life, is extraordinary. The surveyors who examined the dis­trict report that 100 houses have been more or less injured by the explosion, and it is certain that upwards of 2000 squares of glass have been broken. 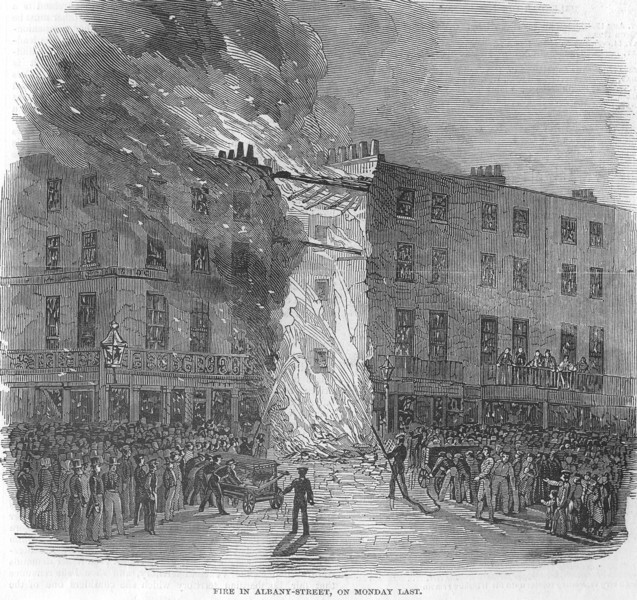 Thirty houses on the opposite side o£ the street, and about a dozen on each side of the scene of the accident, are shattered ; the damage also extends over a number of houses in Ernest-street and Little Albany-street, and even so far as Chester-terrace, in the Regent's-park. These seems no reason to doubt that gas, and gas alone, was the cause of the accident. The person killed was the nursery maid of the family. The owner of the premises, with his wife and child, had been spending the day in the country, leaving his brother and sister-in-law in charge of the pre­mises. During the past few days a strong small of gas had been experienced on the premises, and workmen had made repeated examination of the main pipes, but without being able to trace out the cause. On Monday night, about nine o'clock, on the house being closed, they found the smell of gas getting stronger, and in a few moments, on the shop door bring opened, the explosion oc­curred, forcing the brother and sister through the back parlour window into the garden. At the same time the nurse-maid, who was standing at the street-door, was blown completely over the road, and forced with such violence against the iron railings round one of the kitchen areas as to break the solid metal into several pieces. A man, who was passing along with his cart, was forced out of his vehicle, and severely injured. A lad, named James Stanlite, in the employ of Miss Warraker, the bookseller, of the same street, was blown across the carriage-way and also severely injured; he is still remaining in the hospital in a very precarious condition. At the same moment the iron gratings and window-shutters of the premises on which the explosion took place, together with chairs, tables, and other articles of furniture, were forced over the road, and having carried away the, shop-front of the premises opposite, belonging to Mr. Gibbons, No. 163, sundry pieces of furniture were carried into the latter premises, and having made then, exit at the back, struck the houses in Chester­-terrace, a distance of nearly 200 feet, where a considerable quantity of window glass was also demolished. The floorings of the adjoining house, belonging to Mr. Brown, linen draper, were lifted up, the walls were shattered, the furniture hurled into the street, and a female named Orrick was thrown down and severely injured. The whole of the windows and frames fn the Windsor Castle Tavern were destroyed, and the building in several places set on fire. Several of the inhabitants residing opposite were struck by the bricks and furniture entering their premises; but fortunately none of them were dangerously injured. The surveyor to the Sun Fire-office, and Mr. Hodgsall, the assessor of losses, have visited the ruins for the purpose of ascertaining the amount of mischief done, and are of opinion that no explosion of similar violence has ever taken place in the metropolis ; and it is a matter of astonishment how so large a quantity of gas as must have accumulated in the shop could have occurred. A minute examination has detected the intermediate cause of the explosion—viz., the insecure state of the gas-metre. On examining the metre, which was placed under the shop front, its structure was found to be so fragile that the slightest kick would cause an indentation, the metal of which it was made scarcely being thicker than a sheet of ordinary cartridge-paper. At the back there was found an opening of at least two inches, caused by the separation of the soldering of the upper portion and that of the side. From this opening the gas, doubtless, escaped. The second fire broke out shortly after twelve the same night in the upper part of Dr. Dale's residence. It was first seen by a gentleman named Stiff, who forthwith gave the necessary alarm to the police. The flames at that period ap­peared to be raging out the second floor, but shortly afterwards they penetrated the third floor, and bursting through the windows, they illuminated the city for some distance. Fortunately, the whole of the inmates succeeded in effecting a safe retreat from the blazing premises, although there was some difficulty in removing a lady who had recently been confined. The engines of the Brigade and West of England Company, with those of the parish, attended, and they having been well supplied with water, the firemen were enabled to get the flames subdued by half-past one o'clock, but not until a serious amount of property was destroyed. How the calamity took place is not­ known. The escapes of the Royal Society for the protection of life from fire attended at each fire, and they were of great assistance to the firemen by forming a ladder for conveying the hose to the top of the premises.